The company Check Point Software Technologies has introduced a new line of consumer products under the name 2013 ZoneAlarm security software to access the Internet. The main difference between the new line include full compatibility with Windows 8, as well as support functions first introduced Facebook Privacy Scan to verify the safety records in chronological range of social networks and support standard Do Not Track to evade spy on users of the Web sites and ad networks . 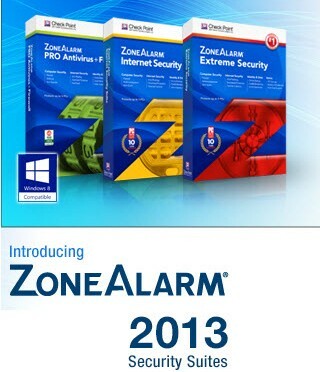 In addition, a new series of products in 2013 ZoneAlarm Antivirus offers advanced modules and a software firewall. Additional features to protect personal information and parental controls to protect users and their families from all known network threats. The new series of safeguards ZoneAlarm 2013, which includes free and subscription products, development of previous versions of ZoneAlarm. With new features like Facebook Privacy Scan (privacy control in social networks) and Do Not Track (bypass control tracking) the user can decide whether to open the published data and actions in Facebook strangers and ad networks. Both of these functions are implemented as soon as the network Facebook has introduced a new policy for dealing with personal data of participants. Facebook Privacy Scan feature in ZoneAlarm 2013 product detects potential problems with privacy issues in the Content and offers recommendations for improving security. In particular, it is proposed to close the information made endorsements (‘Husky’) and comments that may reveal the private and sensitive information about the user. In conjunction with this function the new module ZoneAlarm Do Not Track blocks tracking user (his actions and preferences) advertisers on Web pages, and does so more efficiently than conventional Web browsers.